Washington County Sherrif's Office deputies were recognized for heroic efforts, protecting community. 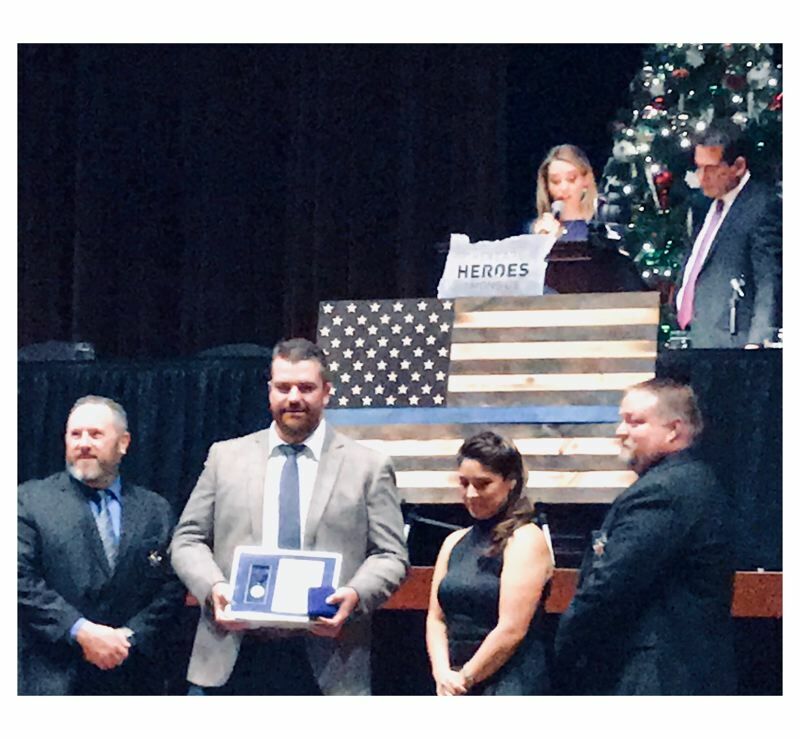 A handful of law enforcement officials across the state were recognized late last year as recipients of various prestigious awards from the Oregon Peace Officers Association. 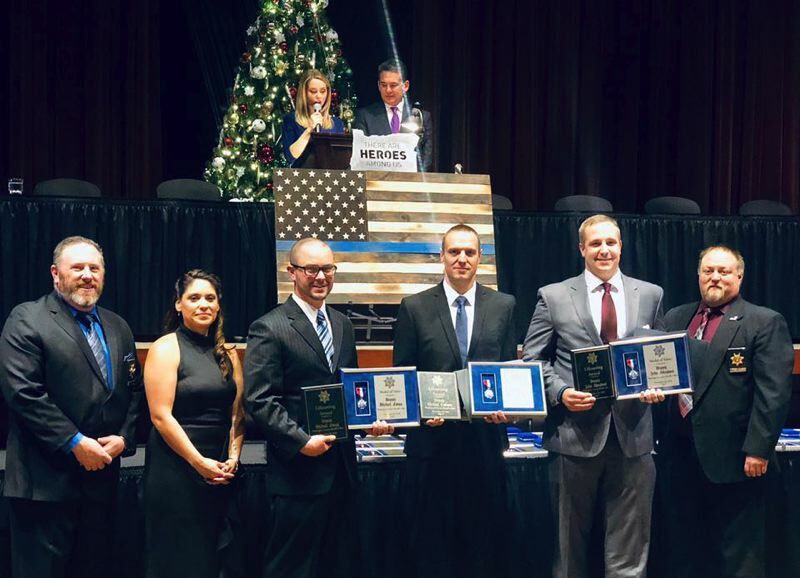 During the association's 49th annual banquet on Nov. 30, five Washington County sheriff's deputies were recognized for having gone out of their way to perform exemplary deeds or services on behalf of their communities, according to the OPOA. "This is one of the few times that folks like this (get recognized)," said Elsa Navarro, senior deputy with the Marion County Sheriff's Office and president of OPOA. "This is where they get recognized the most." Law enforcement agencies and community members are encouraged to nominate people they feel have gone above and beyond to assist and protect their community for one or more of the various awards. The OPOA then determines whether that individual has met the criteria for the given award, and if so, they are granted it during the annual banquet, Navarro said. At the banquet, Deputies Michael Colburn, John Skoglund and Michael Zaugg with the Washington County Sheriff's Office all received the Medal of Valor and Life Saving Award for their successful efforts in responding to a plane crash in April. Colburn and Skoglund were dispatched to an airplane crash in an orchard just outside of Cornelius with assistance from witnesses who had seen the plane come down. 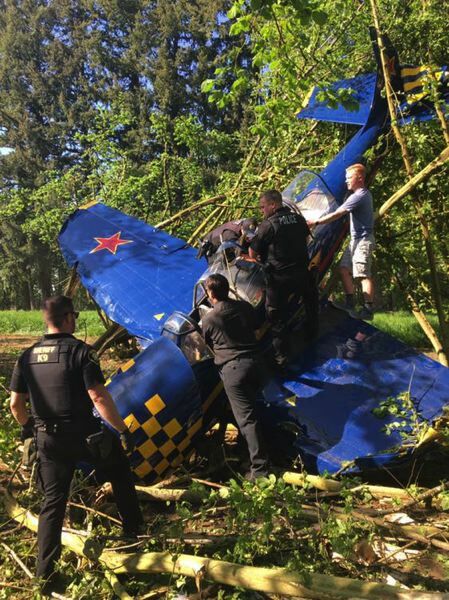 "Upon arriving, they observed the plane which had a wing missing and the tail supported by a tree," the association stated, describing the scene. "This left the plane oriented vertically, which left the pilots with serious injuries and precariously positioned in a badly damaged cockpit. Deputy Zaugg arrived on scene and the three deputies did not hesitate as they climbed into the plane to aid the injured pilots. The deputies worked together and held the pilots in a position that allowed them to breathe until more emergency personnel could arrive." The two occupants, Gennaro Avolio, 88, of Hood River and Canby resident Gary Hagstrom, 73, survived their serious injuries, according to the Sheriff's Office. "A plane crash was definitely unique," Zaugg said of responding to the incident. "We do car crashes all the time that are similar — you've got multiple people entrapped in a car, that kind of thing, but the plane crash was definitely a first time for me, that's for sure." It was nice to be recognized last month alongside his fellow deputies, he said. "Obviously it feels good to be recognized for some of the things that we do," Zaugg said. "A lot of us, fellow deputies, we do this stuff day to day — it's just part of the job, but to get special recognition always feels really nice." A fourth WCSO deputy, John Cage, received a Medal of Valor and Purple Heart Award. 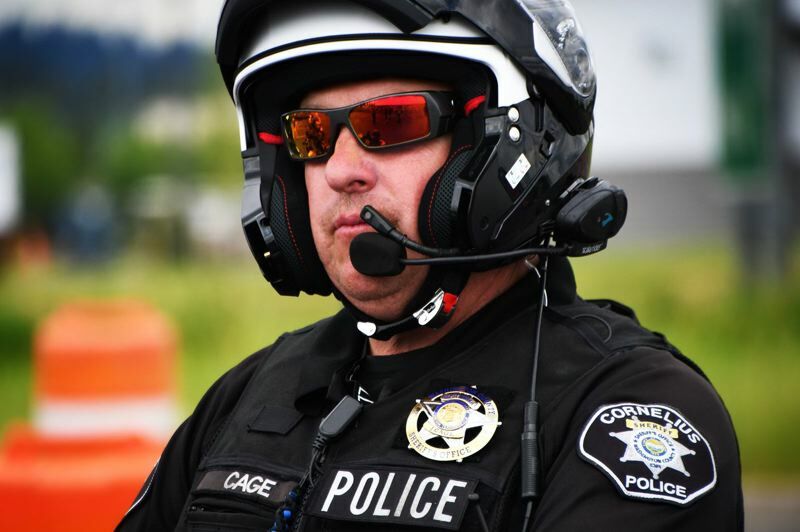 Cage was on duty on Nov. 4, 2017, when he saw "what he thought was a traffic crash on the opposite side of a divided highway," according to the OPOA. "After further observation, Deputy Cage realized the driver of the vehicle was having a medical emergency," the association stated. "Deputy Cage ran to the vehicle, which was still moving at a slow speed, and used his baton to break out the window of the vehicle as it drove into oncoming traffic. Deputy Cage quickly reached into the vehicle and shifted it into park, which brought the vehicle to a stop before colliding into oncoming traffic." Cage suffered a broken rib in the incident, and it was later determined that the male driver of the vehicle had suffered a seizure. Responding to an incident like this was a first for Cage, he said. "We have gone on calls where people are swerving around on the road and you think they are (driving under the influence), and then you realize possibly they could be having a medical issue," Cage said. "That was a first for me, because the car was actually driving itself — that was kind of strange." When it came down to it, however, Cage said he used what he's learned to best respond to the incident. "It was just all your training and everything just coming together," Cage said. "But the public were the real heroes. The public, they were the ones that actually pointed it out, and you just react with what you need to do. You just do what you have to do, and your main goal is to stop the car and make sure the guy is OK."
Cage said he was surprised to hear he had been nominated for the awards, and even more surprised he had won them. "When I heard it I was like, 'Oh, somebody nominated me for this. This is pretty cool.' I was really excited. I was stoked," he said. "And then I read it, and I realized, 'No, you actually won the award.'" Cage added, "To meet the criteria to win the award (was special). You feel like you are just doing your job, which you are, but it's nice to be ... recognized. I was stoked." Cage reiterated that he couldn't have done what he did without the help of the people who stopped on the side of the road as they saw what was happening and jumped into action to assist him. "Without the public, I could've never done what I did — without all the people that helped," he said. "There were a bunch of people around that helped. They were a part of it. Somebody on the other side of the vehicle checked the doors, some guy was running with me, and everybody just kind of disappeared (after), because they all had cars that were parked on the side of the road, too. ...They are the ones that don't get any recognition." Cage later found out that it was a fellow employee who nominated him for the award. "The fact is that I'm really proud of the agency that I work for because they actually took the time to (nominate me)," Cage said. "I mean, that's pretty important that somebody wants to take the time out to do that out of their busy schedule to nominate you. That was pretty important to me." Another WCSO deputy, Mark Demmer, was a recipient of the Purple Heart Award for another November 2017 incident in eastern Washington County. Demmer and several other deputies were monitoring traffic around Beaverton-Hillsdale Highway when Demmer began pursuing a driver who had a cellphone up to their ear while driving. In his pursuit, Demmer was hit by an SUV and thrown into the air, landing in the middle turn lane. He suffered a concussion, eight broken bones, a shattered scapula and ligament damage in his knee. Initially unresponsive after the crash, he ultimately made a full recovery and returned to duty in May.